Take a trip to the Orient! Enjoy this counted cross stitch design by Kooler Design studio and Nancy Rossi. 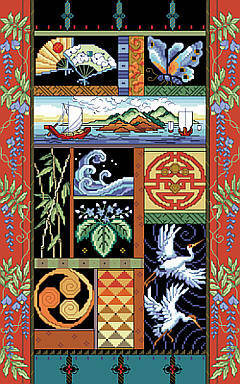 Enjoy all the flavor and serenity of the Orient with this wonderfully detailed sampler. Contents: Stitch Count 140w X 224h, Finished Size on 14-ct, 10" X 16"